The whole discussion on admission to the Holy Communion of people in nonsacramental unions would be non-existent if it wasn’t believed that a sacramental marriage ceases to exist after divorce. Since a husband is subjectively convinced that his sacramental marriage has been irreversibly destroyed and it does not exist anymore, then it means that in his opinion his wife cannot feel pain any longer caused by certain expressions of intimacy occurring between him and the other woman. This way his wife does not exists for him any longer. According to him, also Jesus Christ ceases to live in that sacramental marriage as if the sacrament of marriage didn’t exist any longer. It is as if the wife and Lord Jesus were put into a coffin. What would feel the same husband who after a divorce entered into another union and would like to receive Holy Communion – if he heard that his wife is still alive, still loves him and suffers because of certain expressions of intimacy that occur between her husband and another woman? What would he feel if he heard that Jesus is still alive in their sacramental marriage and still wants to bless them, giving them the grace of healing, liberation and enabling them for mutual love? Does Jesus want to equally fix every sacramental marriage in crisis, both before and after divorce, even if the sacramental spouses are in a 2nd relationship, where there are children? 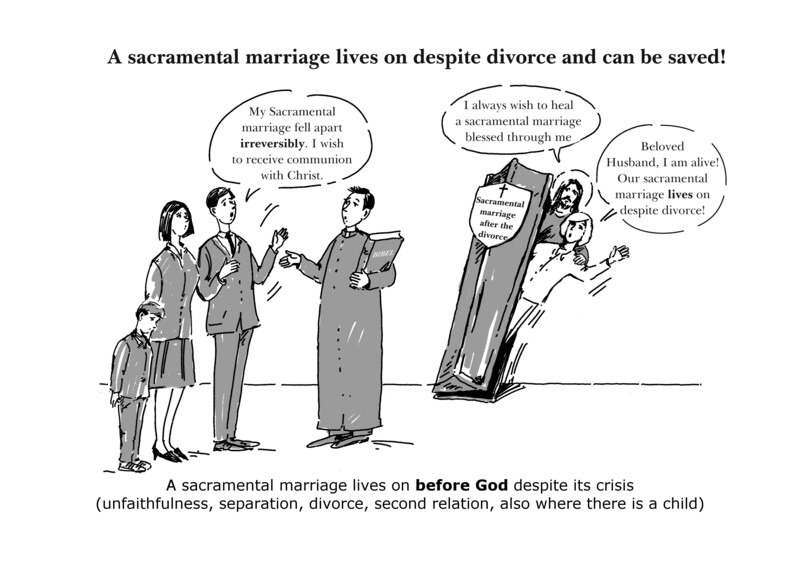 Is the sacramental marriage still valid, after divorce and there is a new relationship, where there are children, the marital vow of fidelity and growth in love for sacramental spouse? And therefore, if there is no obligation to try to get out of the second relationship and return to the sacramental spouse? In light of Jesus’ words: “What God has joined together, let not man put asunder” Matthew (19,6), the 2nd child of the non sacramental relation can be an obstacle to the return of sacramental spouses to each other? Will a faithful sacramental wife feel very hurt, when she sees her husband whose return she is waiting for, acceding to Holy Communion together with his partner from his new non sacramental relation?